Artist Tuesday Bassen is known for her illustrations of glamorous bad girls living their best lives. They rock girl-gang jackets, wield spiked baseball bats, and file their fingernails to dangerous-looking points, not unlike Bassen’s own fingernails. Her line of clothing, which she’s selling from a new namesake storefront in Echo Park, gives all women (and gender non-comforming people too) the chance to live their bad-girl dreams. Bassen’s satin jackets, scout skirts, and embroidered polo shirts are available in ten sizes, from XS to 5XL, rather than the three or four sizes typical at most clothing stores. Bassen, who grew up in Nebraska, first traded snowy Midwestern winters for snowy New York winters before settling in L.A. In New York, she primarily focused on ceramics. “I’ve always been really interested in making art objects that are also practical,” she explains. She attributes her love of practical art to growing up in an environment where the art around her had to be functional. It wasn’t until 2015 that she began to dabble in making clothing. Her well-known zine, Ugly Girl Gang, features characters wearing satin jackets. At the suggestion of a friend, Bassen brought the jacket to life. Now known as the Mixed Emotions Satin Jacket, it remains her most popular product to date. Bassen’s outsider perspective is something she uses to her advantage. “I feel like sometimes when you’re well-educated in a field you normalize some aspects of an industry that are awful,” she says. Her company places an emphasis on the ethical treatment of workers, manufactures almost all its products (with a few exceptions) in L.A., and repurposes dead stock and vintage materials to lessen its consumer footprint. In Bassen’s words, she says she makes clothes that “take that level of whimsy and intrigue, and apply it to a level of street style and practical way of dressing.” Her affinity for “cutesy Americana” and vintage artwork from the ’50s and ’70s is apparent in each of her pieces. 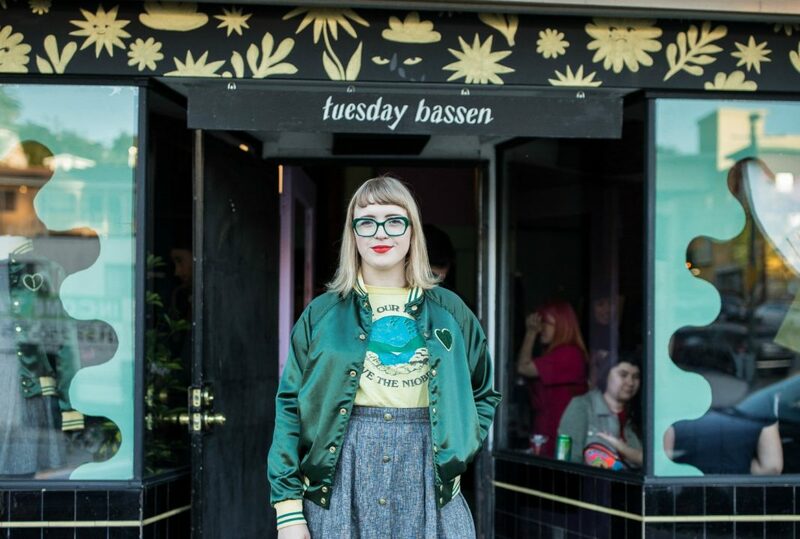 Tuesday Bassen, 1292 Sunset Blvd., Echo Park. The Beverly Center Got a $500 Million Revamp—So, What’s New?